Snapper haunt the coast line feeding on Kina (sea urchins), shellfish, baby crays and bait fish. Terahiki, John Dory, Trevally and Gurnard along with Shark, Hapuku, Kingfish and Kahawai are part of the huge variety of marine life to be found in the waters of Aucklands Hauraki Gulf and the deeper waters “around the back” of the Barrier where Tuna and other game fish can be landed during the season. 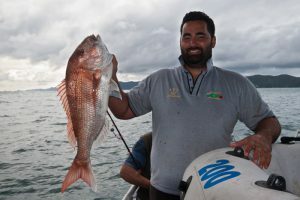 For those who take the time to study their quarry’s habits and who have that most essential of fishing skills… Patience… an exciting catch could await you on your trip to the Island. Winter fishing is very popular here as the fish stocks move out to the deeper waters and ocean currents.At Stray Possum Lodge we often cater to groups of fishers ranging from 5 people to 50, all of whom seem very proffessional and sportsmanlike in their approach, tagging and releasing the big breeding stock and sticking closely to the size and daily bag limits.It is always a pleasure to sit in the bar after the groups have had a meal with us and listen to the tales, not of the ones that got away but of the ones that were photo’d, and then released alive. Great to see! For those needing to hire fishing gear, Hooked on Barrier can oblige. Phone Sue Daly on 09 429 0740 Monday to Saturday. Puriri Bay Fishing Charters: 12m Alloy ex cray boat surveyeed for 13 but prefer 8. Clean tidy vessel,great for groups. Phone Wayne on 09 429 0664. At Stray Possum Lodge we are happy to organise your trip for you, from organising the right boat to meals and accommodation. Just contact us if you need us!